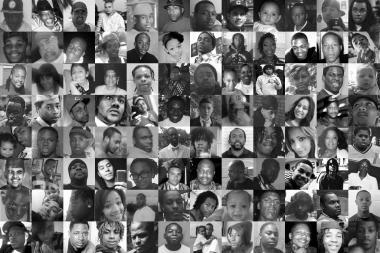 Pictured are 97 of the people murdered in Chicago in 2013. CHICAGO — Editor & Publisher on Wednesday awarded DNAinfo Chicago an EPPY journalism award for its "Murder in Chicago: The Human Toll" project. The website won the award in the category of "Best Investigative/Enterprise Feature on a Website with under 1 million unique monthly visitors." For more than a year, DNAinfo Chicago's reporters knocked on the doors of murder victims' families to get the stories and photos of those killed. Reporters also combed the neighborhoods, talking to friends, family and neighbors of the victims and also spoke to them about living in the line of fire. • Jermia Millsap, a decorated Navy veteran shot dead at a Fourth of July family gathering just hours before his daughter took her first steps. • Tommie Bates Jr., who survived a 2010 stabbing only to be killed this year trying to break up a fight in Austin. • April McDaniel, an aspiring singer killed in Englewood on a June afternoon. • Kevin Ambrose, a 19-year-old Columbia College student killed on his way to meet his friend at the 47th Street Green Line station. • Leonard "L'A Capone" Anderson, an up-and-coming rapper killed leaving a South Shore recording studio. • Dante Mondragon, a 17-year-old father-to-be who was killed Sunday in Albany Park. Also winning an award this year was Crain's Chicago Business in the category of "Best Business/Finance Website with under 1 million unique monthly visitors."